LAS VEGAS, NV--(Marketwire - April 28, 2008) - Utilizing Interop 2008 as a platform, nSolutions, Inc. (www.nsolutionsinc.net) today launched its flagship change and configuration management offering, Network Ontology and Virtualization Appliance (NOVA™). NOVA is a highly scalable, change and configuration management appliance that auto-discovers infrastructure resource configurations, builds a real-time repository of physical, logical and virtual resources, correlates the interdependencies and controls the changes to ensure continuous operational and security compliance. nSolutions will be demonstrating NOVA within a live, multi-vendor environment April 29th, Trusted Computing Group's (TCG) Booth #421. Dr. Harish Rao, nSolutions' CEO, explains the genesis of his company's new offering, "Change and configuration management of infrastructure resources is central to all IT operations. Automation and control of change and configuration management is the only way to handle complexity and assure high availability and security of business services. However, today, these business services are supported by a collection of independent operational silos being managed by -- point solutions -- which only view change and configuration from an individual device perspective e.g. server, router, switch, etc. Virtualization only exacerbates the manageability problem. What was needed is a solution that provides a unified view of the entire IT infrastructure based on: auto discovery, a real-time repository of the infrastructure resources configurations and a decision support system for managing changes holistically." NOVA is a product line of plug-and-play appliances that manages change in global heterogeneous infrastructures through automation and control. NOVA auto discovers the resource configurations and cuts across IT silos to provide a unified view of the configuration state of the infrastructure resources that support business services. The real-time NOVA Repository maintains a virtual construct of the auto-discovered configurations and the interdependencies among the components of the core and the applications infrastructures. NOVA's Change Impact Analytics (CIA) allows a variety of reports to be generated for all stakeholders responsible for operations, compliance and security. 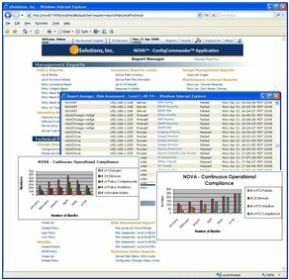 "nSolutions brings a unique set of capabilities to the change and configuration management space," said Richard Ptak, managing partner and analyst at Ptak, Noel and Associates LLC. "NOVA by means of an easy and simple insertion of an appliance -- provides immediate visibility and understanding of business services -- without the long cycle of project development, while eliminating useless data models." configuration discovery, based on industry standards. data with a federation of CMDBs. decisions for managing change from a services perspective. availability of business services at a lower Total Cost of Ownership (TCO). "Enterprises have no choice but to reduce operational costs and minimize business risk from IT. In order to achieve this, IT personnel must manage change pro-actively. NOVA's automation and analytics uniquely provide real-time information for supporting operational decisions," Rao added. "The ontology and virtualization methodology of NOVA readily accommodates the manageability problems resulting from high rates of technological changes. This innovation overcomes the limitations of traditional approaches of managing change in IT infrastructures that has evolved over the last several years." NOVA is currently shipping with pricing starting at U.S. $20,000. For additional announcement resources, please view nSolutions' Events page. For addition information on automating change and control, please view nSolutions' white paper, Minimizing Business Risks in Enterprise Networks. Based in San Jose, California, nSolutions, Inc., provides plug and play products for automation and control of IT infrastructures to minimize business risk from IT. Spun out of Bell Laboratories Research as an independent business, the company now offers Network Ontology and Virtualization Appliance (NOVA™), a highly scalable line of products that manage change with unmatched visibility and control of configurations in heterogeneous, globally distributed infrastructures. nSolutions markets NOVA directly and through its channel partners worldwide to medium to large enterprises in the financial, healthcare, manufacturing, and retail sectors. About this company nSolutions, Inc.